"The Mediator Between Head and Hand Must Be the Heart"
Before you get caught up trying to decipher the sprawling title of SEPULTURA's 13th album, "The Mediator Between Head and Hand Must Be the Heart", the core principle behind it is inspired by dystopian themes conveyed in the 1927 silent film classic, "Metropolis". This sort of delving should be no surprise to SEPULTURA followers, since Andreas Kisser of late has been consulting literary and cinematic works for inspiration, trending by the band's recent works "Dante XXI" and "A-lex". 2011's "Kairos" was more of a straightforward SEPULTURA venture with no real concept and fans at-large embraced the chewy and thrashy tone of that album. Thus, consider "The Mediator Between Head and Hand Must Be the Heart" more in the same vein from the standpoint that Kisser and SEPULTURA 2013 (which now includes Eloy Casagrande on the drums in the stead of Jean Dolabella) are concentrating on linear modes of thrash and mash with extracurricular earthy grooves sprinkled along the hefty ride. Considering the fact SEPULTURA now has one of its founding fathers, Max Cavalera and SOULFLY as direct competitors at Nuclear Blast Records, there's no doubt going to be a de facto square-off in the eyes of the fans. SEPULTURA's conceptualizing on this record not only heralds Fritz Lang's visionary tale of mankind's seduction (and ultimate dehumanizing) by the big machine, but it also dabbles in propositions that religion is fruitless and mainstream society is obtuse to the suffering of its less fortunate brothers and sisters. You know, the same as it ever was in SEPULTURA. As with "Kairos", SEPULTURA has their engines humming with plenty of velocity as well as rolling tribal percussion. Turning to Ross Robinson, who produced the band's classic "Roots", (and with no irony, SOULFLY's first full-length CD) "The Mediator Between Head and Hand Must Be the Heart" has its songwriting moods in the right place and that equates into a bloody good ride, if not quite meeting the premise of devastating evolution Ross Robinson would have SEPULTURA fans believe. Robinson reportedly notified Andreas Kisser of his intent to "smoke" the latter album on "The Mediator Between Head and Hand Must Be the Heart", a bold and potentially rash assertion. "Roots" has the benefit of innovation on its side, while SEPULTURA's newest project finds the band already having stretched many fragments and parameters beyond their key speed zone. 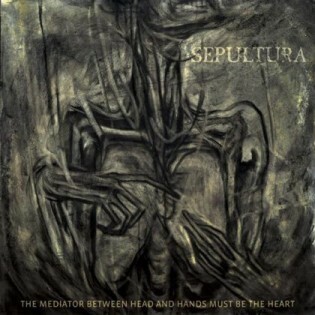 What's best about "The Mediator Between Head and Hand Must Be the Heart" is that it feels like a proper SEPULTURA album, finding a happy medium delved from the band's last three albums. In effect, most people should come out of this listening session pleased by the results. Kisser's riff-o-matic shredding and wiggly solo jerks are trusty as always. Always overlooked for his share of SEPULTURA's rolling thunder, Paulo, Jr. is a rumbling engine of chaos on this album. Derrick Green (who's finally starting to be let off the hook somewhat by the jaded sanctions of the metal public) delivers another confident performance. Green is actually allowed to show a different dimension to his customary gruff vocals on "Grief" where he wallows cleanly (and forlornly) on the verses before plowing through his raspy yelps on the choruses. SEPULTURA these days have a young buck riding the kit and while he doesn't yet possess the calamitous fills of Igor Cavalera, Eloy Casagrande, as Derrick Green long has, fits the mold of this group just fine. Casagrande is a little choppy on some of his rolls, but he drops more than his share of grenades upon the album. He scorches on the careening "Trauma of War" and then he delivers dynamic swaps between stamp and thrash modes on "The Vatican" that follow a nervy opening featuring church tolls, cantata and piercing synths. In order to stand up even remotely to "Roots", SEPULTURA is expected to fuse traditional percussion elements and while subtle in spots, blatant in others, they do deliver the goods. Some fantastic conga work busts loose upon the banging bridge on "Manipulation of Tragedy", clapping triumphantly amidst the enormous groove of the cut. "The Bliss of Ignorants" gets extra loft out of its accusatory stomp with a gnarly segue of tribal rhythms floating out of Andreas Kisser's dotting solo. If there's any authentic connection to "Roots" on this album, it's minute at-best, the closest coming with "The Age of the Atheist", which finds the interchanging rhythms between crawl and blitz tapped out with fragrant percussion. SEPULTURA are returning to their heritage in increments while Max Cavalera and SOULFLY continue to raze away the tribal elements that gave the offshoot such tremendous character. With SEPULTURA, that ethnic flavor is plentiful again and most welcome. "Obsessed" operates in the same manner as "The Age of the Atheist", only in this case, the brisker touch of the song is aided by the double-hammer acumen of none other than SLAYER's Dave Lombardo. Handing out more than just a mere cameo, Lombardo all but jerks SEPULTURA back momentarily to their "Beneath the Remains" days. Derrick Green sounds like he's trying to live up to the moment by dousing the song with some of his meatiest screams and crustiest whispers on the record. "The Mediator Between Head and Hand Must Be the Heart", is adventurous, but not quite in the same manner as "Dante XXI", "A-Lex" and of course, "Roots" long before them. The Portuguese rapping trailing throughout the funky calypso of "De Lamo Ao Caos" is a ballsy maneuver and it delivers a pretty killer payoff, at-that. It's admirable for Ross Robinson to want to push his clients to a higher level of craft, particularly when they find themselves in the unnecessary position of having to justify themselves with every single release that's come out since 1998's "Against". While it's evident at this point Andreas Kisser, designated leader and creative spearhead of the band, has no intention of inviting overtures of a Cavelera reunion, there's no practical reason to judge SEPULTURA with that looming specter over their heads. Andreas, Paulo, Jr. and Derrick have done justice to this band over the past fifteen years and "The Mediator Between Head and Hand Must Be the Heart" should prove to be their moment of redemption, even in the eyes of SEPULTURA's naysayers.